Note: The directions given below lead you to the visitor's entrance of UT's J. J. Pickle Research Campus at 10100 Burnet Road. Regular business hours are from 8:00 am until 5:00 pm Monday through Friday. All visitors must sign in at the Guard Station at this location. The guard can give you further directions to BEG if you need them. Go west on Braker, continuing past Lamar and Metric to the Burnet Road intersection. Turn left onto Burnet Road and proceed approximately .25 miles to the visitor's entrance of the J.J. Pickle Research Campus on the right. Distance from IH-35 is about 4 miles (6 km). Traveltime from Austin Bergtrom Airport is about 30 minutes to an hour. Go east on Braker Lane and turn right onto Burnet Road. Proceed approximately .25 miles to the J.J. Pickle Research Campus visitor's entrance and turn right. Proceed to the guardhouse to sign in. Coming from the South, take the Burnet Road exit and turn right onto Burnet Road. Proceed approximately .5 miles to the J.J. Pickle Research Campus visitor's entrance on the left. Travel time from Austin Bergstrom Airport is about 25 to 45 minutes. Coming from the North, take the Burnet Road exit and turn left under the freeway. Proceed approximately .5 miles to the J.J. Pickle Research Campus visitor's entrance on the left. Loop 360/Capital of Texas Highway deadends into the MoPac access road; go north (left) at this intersection and follow the exit to Braker Lane. Follow directions above for MoPac (Loop 1) Braker exit. You can find a list of hotels close to the PRC Campus here. PLEASE NOTE UT/PRC PARKING RULES. YOU MUST PURCHASE A PAY AND DISPLAY PARKING PASS TO PARK AT PRC OR RISK BEING TICKETED. Stop at the Guard Station for directions to a “Pay and Display” station (see location on map). Past the Guard Station, turn right onto "Exploration Way" and proceed to "Creativity Trail". The Bureau, Building 130, is on the right (east) side of the street; the Core Research Center, Building 131, is to the left side of the street. Pay and Display permits are valid in spaces marked ANY UT PERMIT. Holders of UT's "A," "C," or "Disabled" parking permits may park on either the Road A spaces, or in the north or east parking lots. 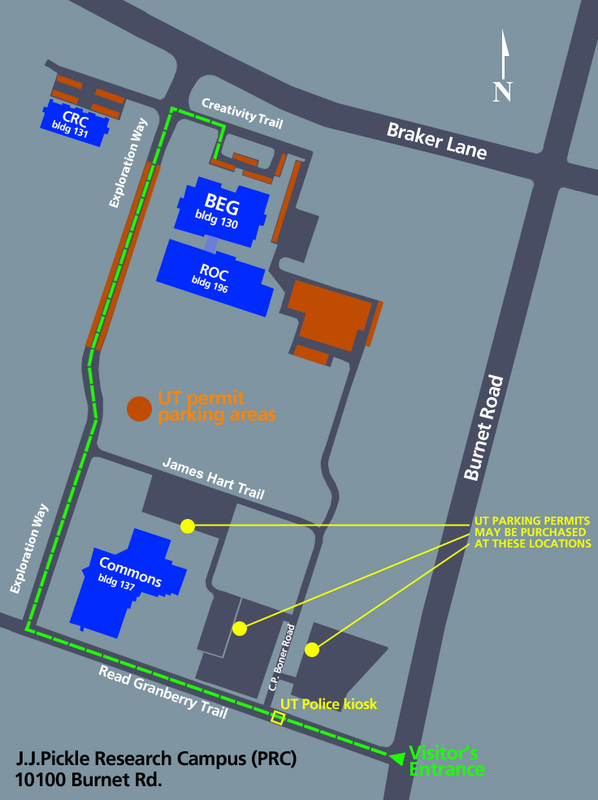 The image at right is a detailed map of the section of the Research Campus where the Bureau is located and shows locations parking permit purchase kiosks.